Thanks to state incentives, improved technology, and a fall in modern cash crops, Colorado farmers are now looking to wind power to make a steady living. 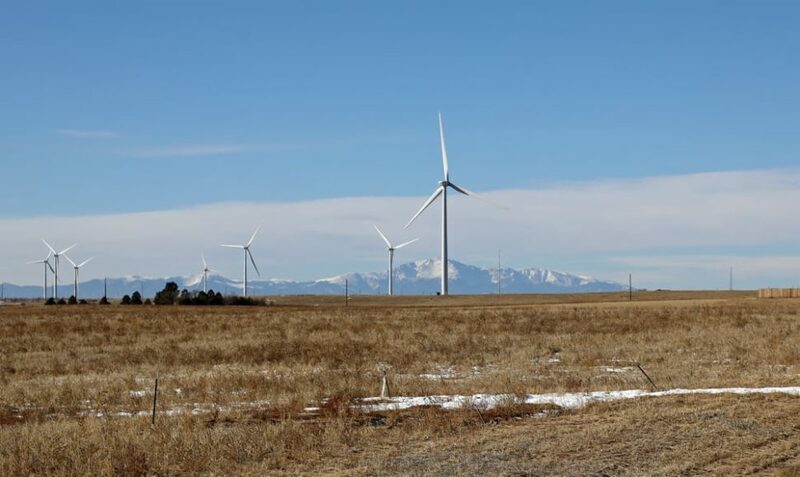 Besides boosting local economy via jobs and taxes, wind power is helping farmers in rural Colorado cope with dwindling crop prices and generate revenues to keep their farms running. Wind power is experiencing strong growth worldwide, and the trend seems to be rising year by year. Wind energy growth is an additional way to help countries achieve their goals in cutting carbon emissions and curbing global warming. The latest report from the Global Wind Energy Council (Global Wind Report 2017) shows that the world’s wind industry has added significant capacities in 2017. The new 52 gigawatts bring the global wind power capacities to a total of 539 gigawatts. China, which “will continue to be the dominant market globally, but with less spectacular growth than in the past decade”, is still the world’s biggest wind power market with 19.7 GW of new wind installations in last year. Coming in second, the U.S. has added a little over 7 GW of wind capacity in 2017. Within the U.S., the state of Colorado is a rising player in the wind power field, and part of this impetus is driven by farmers. According to the interactive map from the American Wind Energy Association, the wind power market is dominated by Texas (22.79 GW) of installed wind power, then Oklahoma (7.49 GW), and third, Iowa (7.31 GW). We have to go down to the ninth spot on the list to find Colorado, which has 3.10 GW of wind power capacity, making up over 17 percent of the state’s energy mix. With $6 billion injected into the wind market, and supporting 5,000-6,000 of jobs, wind power is making a growing impact on Colorado’s economy. Colorado farmers found in the leasing of their lands a new stream of revenue that helps them offset the damage done by plummeting prices of traditional cash crops. Literally open to the four winds, with little to no obstacles, farms, and pasturelands are particularly suitable for the installation of wind turbines. Lighting, crop irrigation, dairy cattle milking, and other daily activities increase the electricity costs of a farm. By installing wind turbines, not only can farmers gain an energy autonomy, they also will make profits that they can reinvest to sustain their livelihood. An estimated total of $5 -10 million annually goes to Colorado landowners as lease payments. “It doesn’t matter if there is hail, rain, lightning. As long as the wind blows, we’re producing energy that we’re able to profit from. It is our new cash crop,” said one of Colorado farmers who’ve been severely hit by a saturating crop market. Farmers looking up to cash in on wind power have two payment stages, according to the project development. They’ll keep getting lease payments (2-10 dollars per acre) until the wind turbines are up and running, at which point they’ll start receiving payments based on the amount of power generated by the turbines. For example, with a two-megawatt turbine, a farmer can look up to earn $10,000 per year. From there, revenues would go up and down, but won’t stop unless the turbines stop. As long as there’s wind blowing, cash will keep coming in. Are we definitively past the debate of wind power profitability?